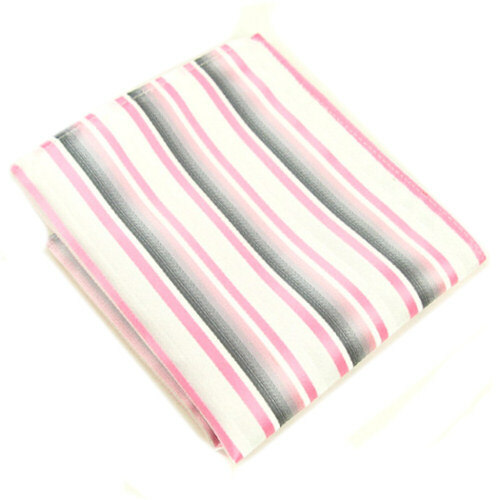 This pocket square has crisscrossing blue stripes against a white background. Made from 100% premium silk material, this pocket square can be worn to almost any formal or business occasion. The varying shades of blue mixed with a bit of purple is a classic look that anybody can pull off. Wear this to: business meetings, job interviews, formal corporate events. Fondly called “The Silver Fox”, this Grey Gentlemen’s Pocket Square will turn you into an instant head turner. The grey colour shimmers against the silk material. It’s definitely a men’s accessory that you should not use to blow your nose in – carry a separate hankie for that! Wear this to: weddings, black tie affairs, formal events. The yellow polka dots against a dark background adds a playful touch to an otherwise austere suit, so make sure to add this Yellow Dotted Hankie for Men to your collection. The pocket square measures 24 x 24 cm. and it’s just the perfect size to fold into your suit or dinner jacket, or even a casual blazer. Wear this to: the office, formal-casual events, hot dates, formal dinners. Add a cheery element to your outfit – even if it’s not the holidays yet – with this Christmas Pocket Square for Men from MensPocketSquares UK. The shimmery silk makes the combination of white, grey, green, and red stripes stand out. Wear this to: corporate parties, upscale pubs, bars, holiday parties. Citrusy fruits are definitely the inspiration behind the look of the Fox and Luther Green Stripe Men’s Pocket Square. When worn with a dark jacket the zest of the green colours come out, which definitely makes for an eye catching look. Wear this to: almost anywhere, especially when you’re wearing a brown jacket. As you can see, there’s a silk pocket square from MensPocketSquares UK that you can wear to almost any occasion, so start bulking up your collection of this unique yet useful men’s accessory right now.